You should not despair even if there is limited space in your bathroom. 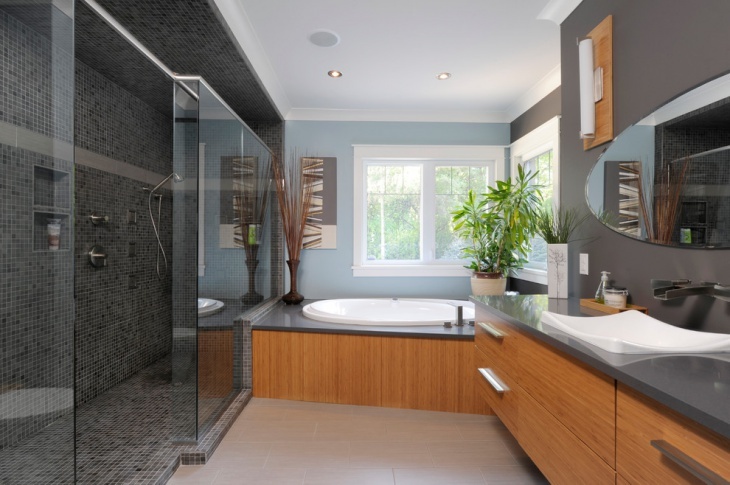 It is still possible to create a cozy bathroom, all you need are some great ideas and guidance. 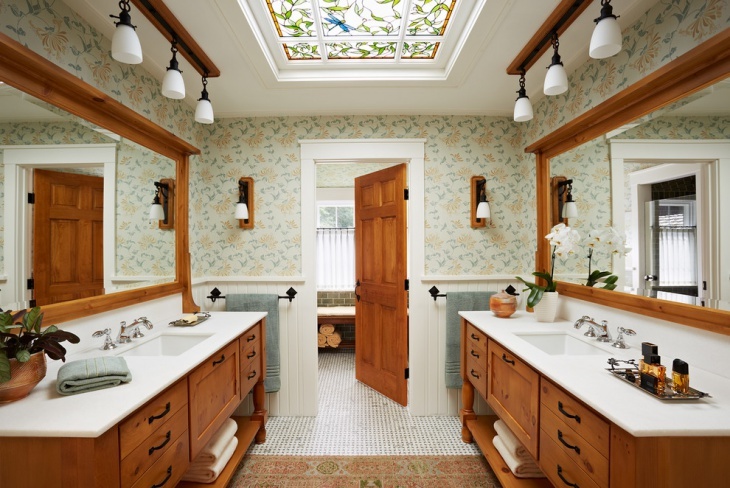 Of course, the right lighting fixtures and bath materials are also important factors for consideration. 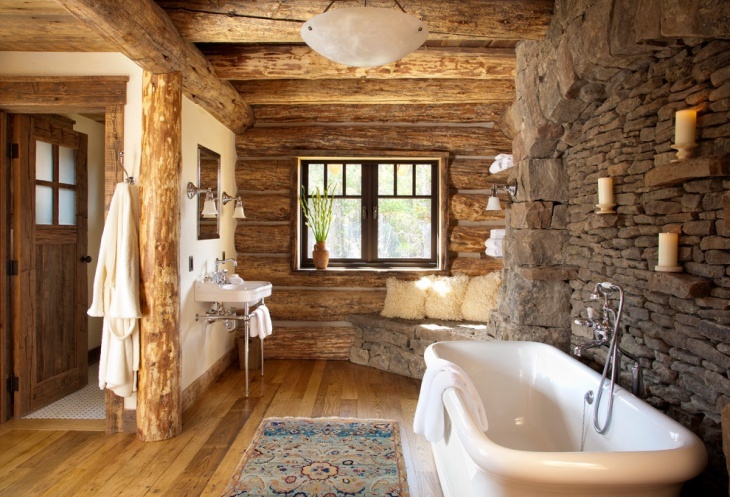 For instance, you may not want to add a huge tub into your bathroom design if you are aiming for the cozy appeal. 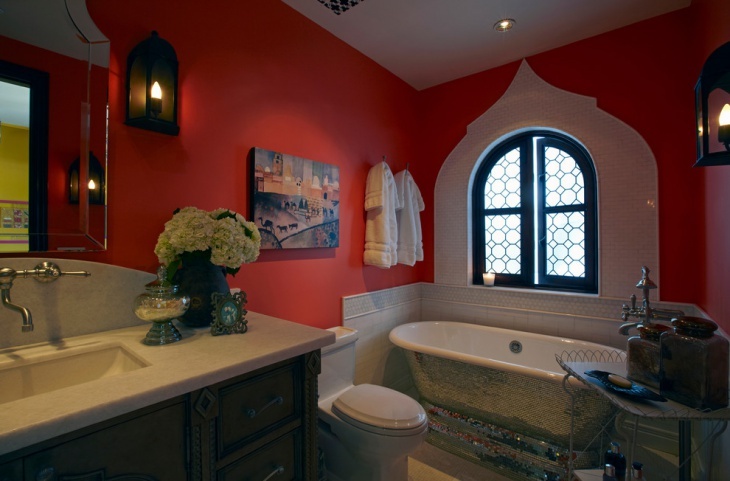 Use of decorative wall design is a good way to provide a cozy look into your bathroom. This specific bathroom has a nice flower patterned wallpaper and two long walls installed with two long vanity mirrors and sink counters. With two mirrors facing each other, the rather tight spaced room looks spacious. 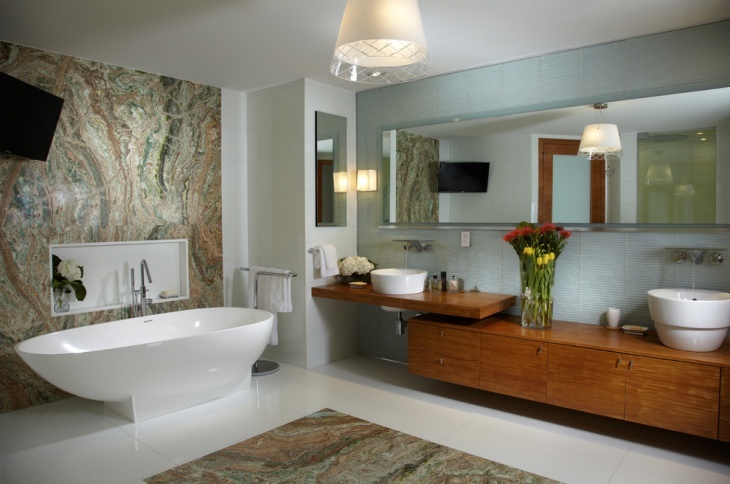 For a cozy look on a spacious bathroom, the best idea is to lavishly and uniquely design it. This bathroom, particularly, has a simple yet classy design. The freestanding oval tub occupies one wall with a pendant light hanging over it. The shower enclosure – opposite the tub – has glass walls and door, giving the occupant a view of the whole bathroom while showering. The sink and vanity set is place right on the center wall – a unique idea indeed. 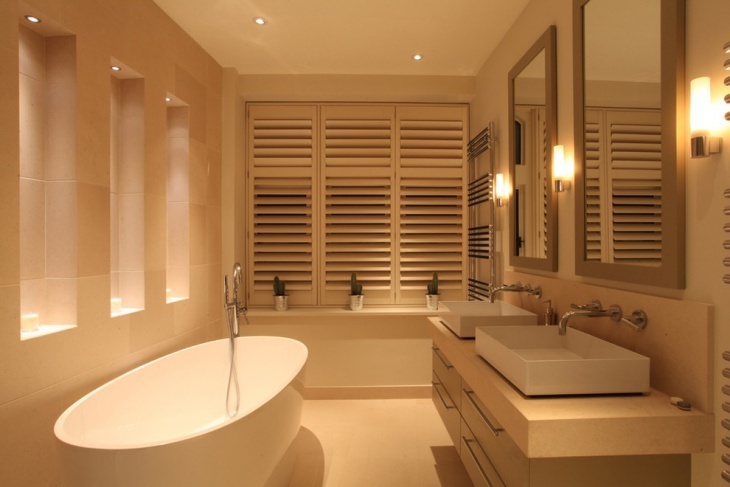 Wooden cabinets are always a must in most modern bathroom designs. If you want to stay away from the common wooden cabinets you usually see, you may want to check out this bathroom. The cabinet used here is floating and is just a single row of storage with a sink on top. The second smaller sink is installed on a board placed on one end of the cabinet and it was set on a slightly higher level. Polished white floor on an all white bathroom interior is surely going to stand out. The bathroom is very neat, clean and absolutely classic. The tiles on the floor are hexagonal and polished to perfection. The sink top and the opposite cabinet/dresser are made of marble, while the shower is enclosed by tiles and glass. A bathroom that defines total relaxation? 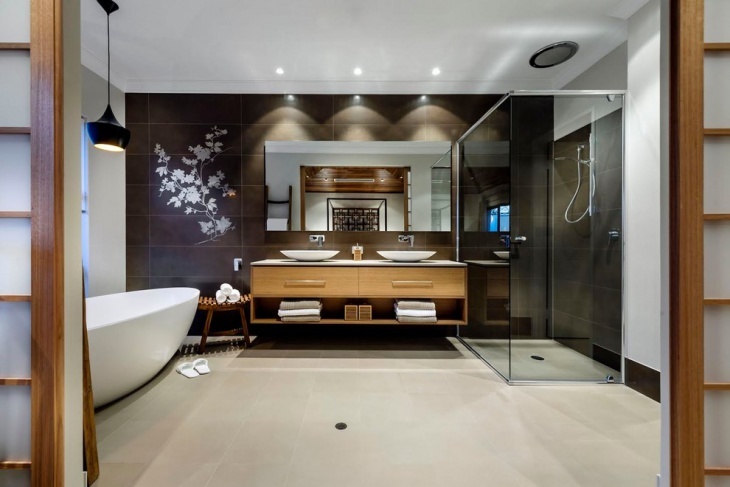 If that is what you are aiming for, then check this bathroom design out. The all-mirror wall is a stand-out, while the additional of the bathroom ottoman and the reclining chair is impressive and surprising at the same time. The shower area has built in bench, allowing for a spa bathroom experience when needed. A tub in the middle of the room is no doubt a vintage idea. The wooden cabinets on the side walls are additional traditional features. This bathroom is a sure fire winner if you want something extraordinary and classic at the same time. The corner bathtub used for this bathroom is one of the many aspects that provide the modern appeal. The long vanity mirror on the opposite wall is another contemporary feature that you may want to consider for your own bathroom design. 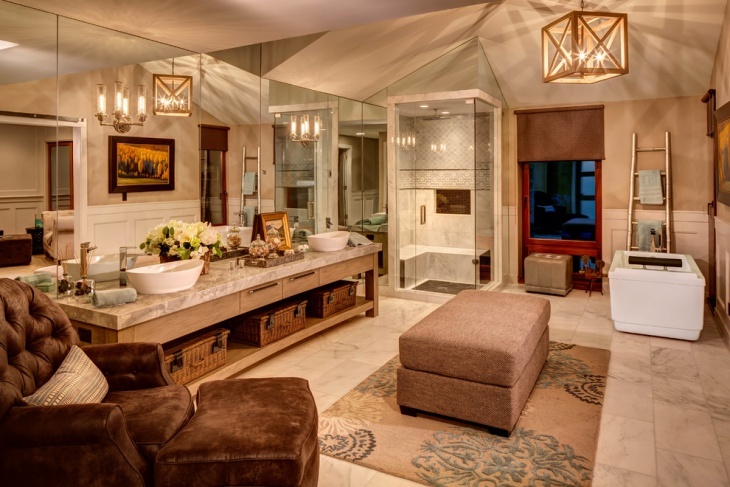 The double shower with glass windows is surely nice, cozy and perfect for couples. The black mosaic tiles used for the shower area of this bathroom provide the classy accent to an otherwise simple and regular bathroom design. 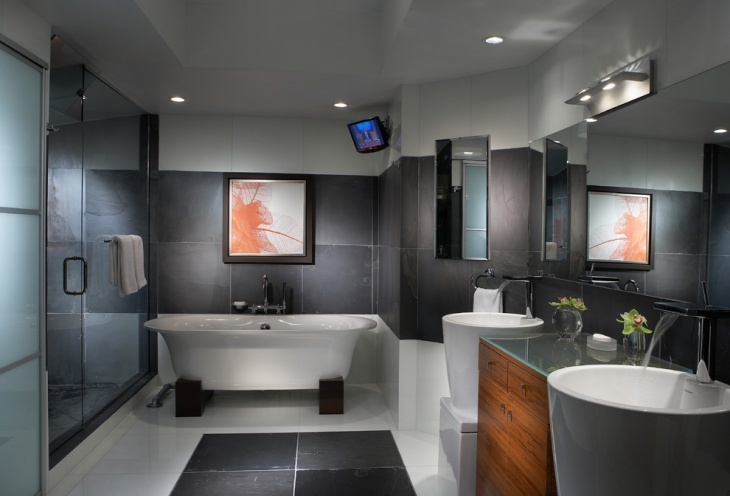 Space is definitely maximized on this design, with the tub occupying the end of the vanity and the shower enclosure. 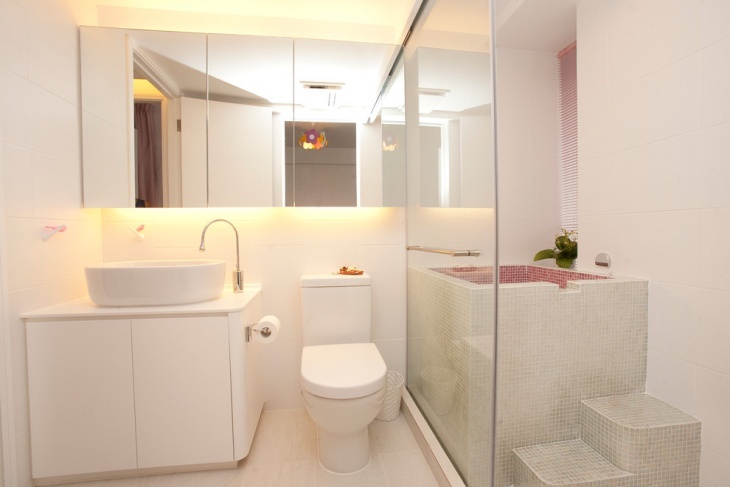 The transitional aspect of this bathroom provides easy transfer from the tub to the shower or vice versa. 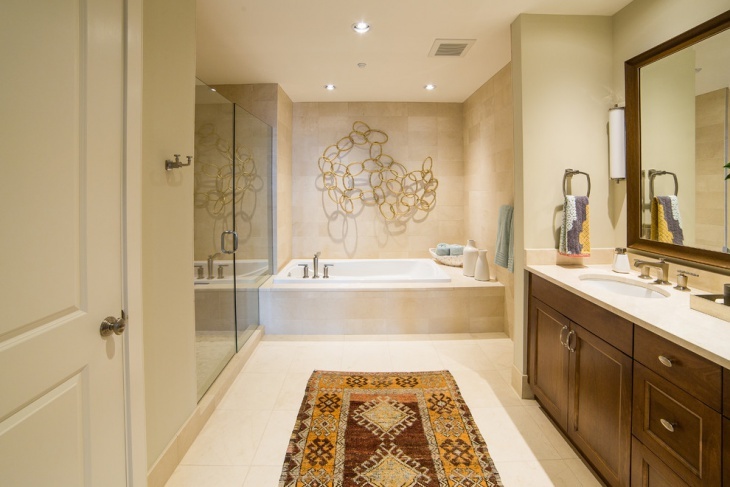 The rug is very classic and the vanity area has white countertop and dark cabinets. The chained circles on the wall add an effective contemporary appeal to the whole setup. 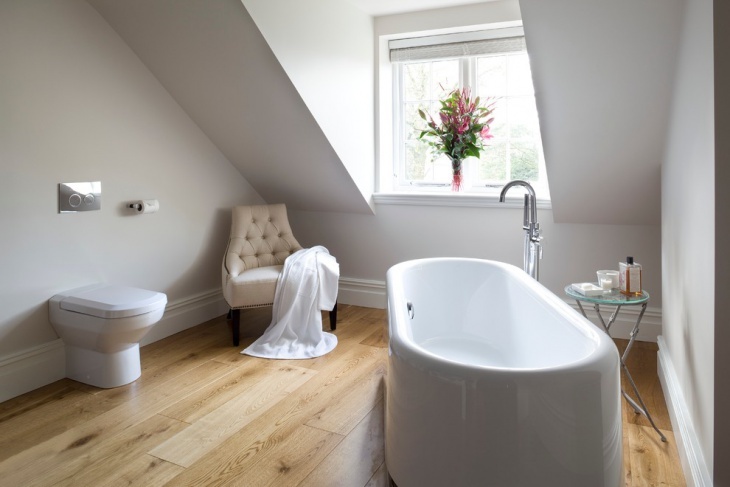 Another all-white bathroom design that would surely take your breath away, this one is proud to present a freestanding tub placed by the window. A reclining chair provides coziness and comfort, while the vanity set adds the functional aspect.